The Service has failed to look at the best scientific data available. 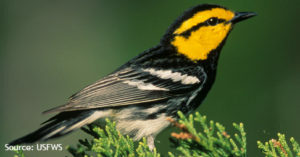 The Court declaring the final rule listing unlawful, and that the refusal to delist the warbler is unlawful because Defendants failed to comply with NEPA. The TXGLO claims that the warbler’s listing significantly impacts the market value of certain TXGLO lands diminishing their ability to receive revenue from Texas public lands for the benefit of Texas schoolchildren.